Cyclones are the most economical and reliable means for the removal of particulates from a gas stream. 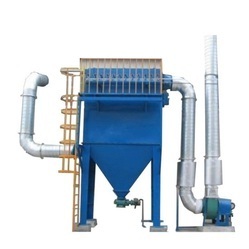 Conventionally, a Classic Cyclone has been the equipment to clean the dirty air to get rid of suspended particulate. However, due to the limited technologies resources available, the particulate collection efficiency was lower. A multi Cyclone as was conventionally available was a battery of Axial or Radial entry Multi Cyclones. An axial entry cyclone is suitable to handle very large gas flows with lower collection efficiency however Radial entry cyclones used for handling relatively small gas flows with higher collection efficiency. Old Cyclones suffers from economical achievement of High fractional collection efficiency at lower pressure drop. However our designed cyclones and multi-Cyclone have very good collection efficiency as compared to other designs. 1. Flow Configuration: Axial Entry / Radial Entry / Single Cyclone / Multi-cyclone. 2. Handling media: Flue gas / Contaminated Air / Water. 3. Material of Construction: Carbon Steel / AISI 304 / AISI 316 / hard lining / Custom Made. For every metric ton of steel produced, 10 to 25 kilograms of dust is accumulated. There‘s no question that modern dedusting systems are crucial. The most important goals are high reliability, strict compliance with prescribed threshold values and reasonable energy consumption. 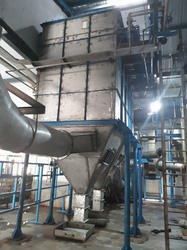 Recovery of particulate matter from exhaust gas is vital for any industry and in many instances a bag filter is deployed to separate fine particles from air / gas to recover, finished product and /or to limit the particulate pollution of flue gases emitting from the plant. We offer Reverse Pulse Jet Bag Filter, which are proven to be most suitable for vast pollution control needs. 1. Flow Arrangement Parallel flow / Reverse Pulse Jet. 2. Temperature Rage 00C to 2400C. 3. Flow Rate - 1000-100000 m3/hr. 4. Material of Construction Carbon Steel / Stainless steel. 5. Fabrics Polyester / Polypropylene / Ryton (PPS) / P - 84/Acrylic / Nomex. Can be used with any type of dust and with temperature ranges from 00C to 5400C. Can handle moisture levels up to 10 %. 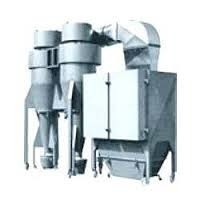 We provide Insertable Bag Filter that is directly positioned on Coal Injector and other conveying systems. 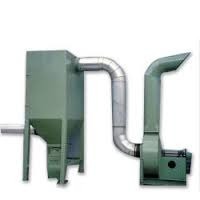 The Insertable Bag Filter that we deal in helps easy discharge of dust on the bin, silo and conveyors. We offer Reverse Pulse Jet Bag Filter, which are proven to be most suitable for vast pollution control needs. Jet Bag filters are deployed to separate fine particles from air / gas to recover or to limit the particulate pollution of flue gases emitting from the plant. Looking for Air Pollution Control Equipment ?